It's October, and we are celebrating National Physical Therapy Month! We are honored to interact with and support such an active, passionate group of clinicians, and we want to reward you for your dedication to your field of expertise. We'll have a month-long promotion to celebrate physical therapy..
Because of the success of our #Tips4LiteGait promotion last October, we are doing it again! Each day, we will post a new tip for LiteGait use across our social media sites. Please ​follow us and get the daily tips in your news feeds. Here's the fun part: every time you SHARE or RETWEET our posts this month, along with #Tips4LiteGait16, your name will be added to our drawing for prizes, including e-gift cards and LiteGait accessories. You can enter as often as once per day, as long as you share/tweet different posts on different days. Our drawing will be held at the conclusion of PT Month, and winners will be notified via social media or email. Use #Tips4LiteGait16 across all sites. Thanks for joining in on the celebration! Don’t forget to join us for our Journal Club this month, where we’ll discuss the article “Partial body weight support treadmill training speed influences paretic and non-paretic leg muscle activation, stride characteristics, and ratings of perceived exertion during acute stroke rehabilitation.” Pre-register for this webinar and you’ll be able to participate for FREE! MR: What was your first impression of LiteGait? MR: What do you think will change about LiteGait (or Mobility Research) over the next five years? 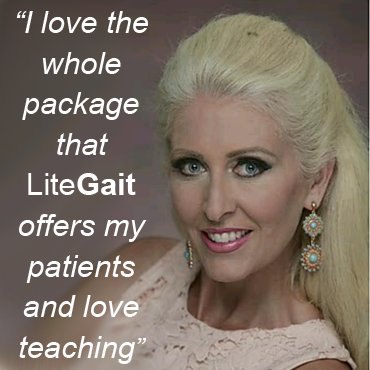 Cassie: I would like to see Physical Therapy schools have access to LiteGait. So it could be treatment tool they can learn about and not be intimidated by. Students always have research they have to do, so that may spark some reach ideas as well. I seem to only be seeing the LiteGait in rehab settings. I am pushing to get a LiteGait in our O.P therapy department as well. Burnfield, J. M., Buster, T. W., Goldman, A. J., Corbridge, L. M., & Harper-Hanigan, K. (2016). Partial body weight support treadmill training speed influences paretic and non-paretic leg muscle activation, stride characteristics, and ratings of perceived exertion during acute stroke rehabilitation. Human movement science, 47, 16-28. The new Integrated FreeDome paired with our BiSym Scale provides a real time display of the weight supported on the Left, Right and Total patient weight during gait. 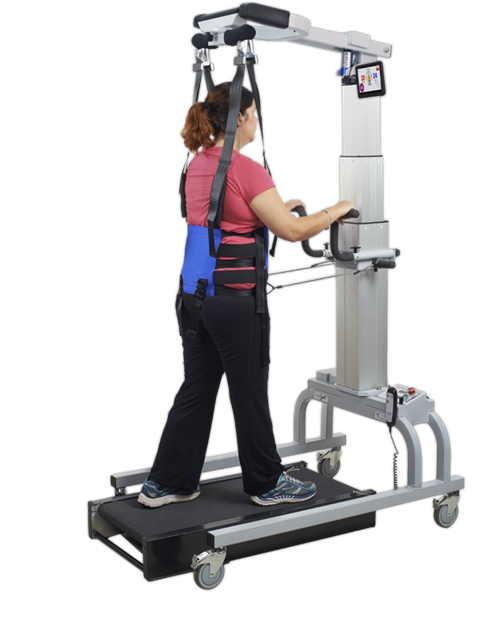 FreeDome allows the patient to freely rotate in place while remaining securely supported by the LiteGait® harness.